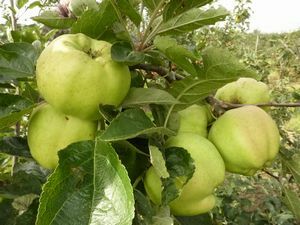 Calville Blanc D’Hiver - Dual Purpose Apple Tree £12.75 - Dual Purpose Apples Apple Trees and Fruit Trees For Sale. Buy at competitive prices with wholesale discounts. Possibly one of the tastiest traditional apple varieties. The flavour develops on keeping and can be described as sweet intense and rich. The flesh is juicy. This French variety originates from around 1600 is also excellent for cooking and holds its shape well.